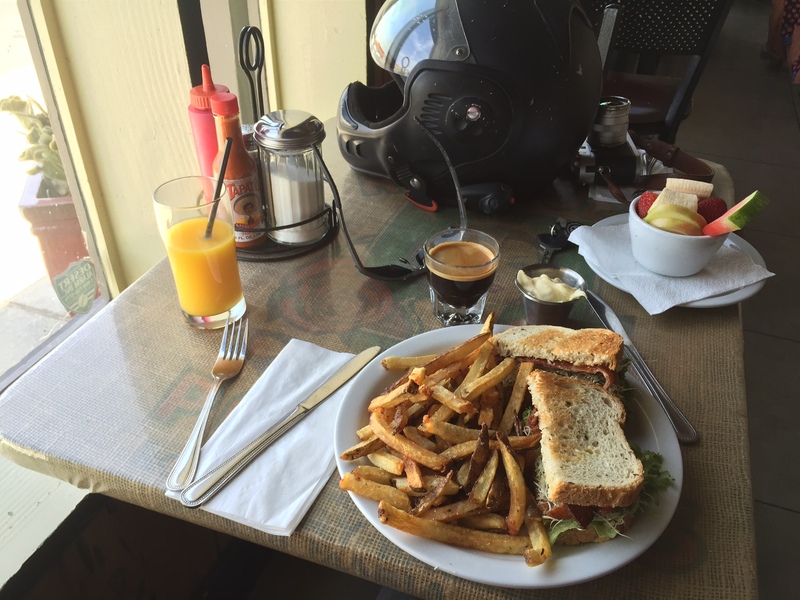 Discussion in 'Ride Reports - Day Trippin'' started by caliform, May 16, 2015. Oh man. 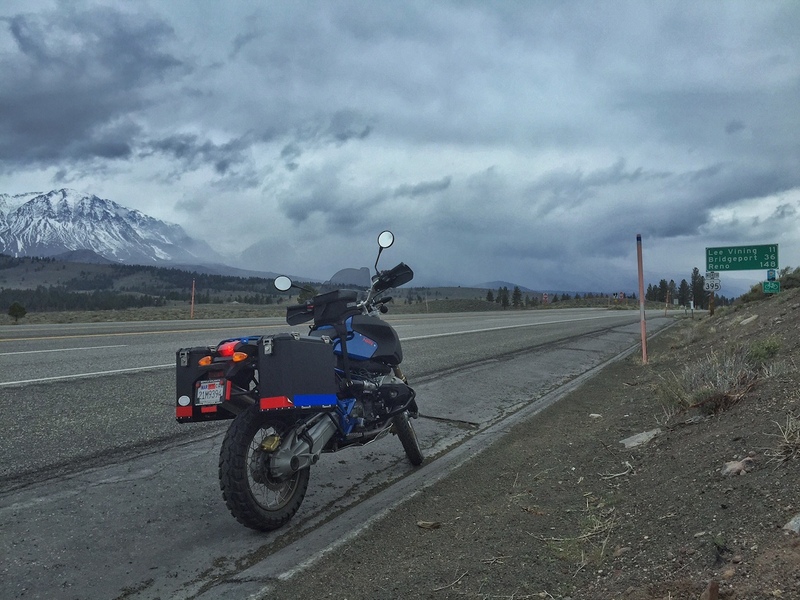 When I was in Bend on my ride to Alaska last year, a seed was planted. 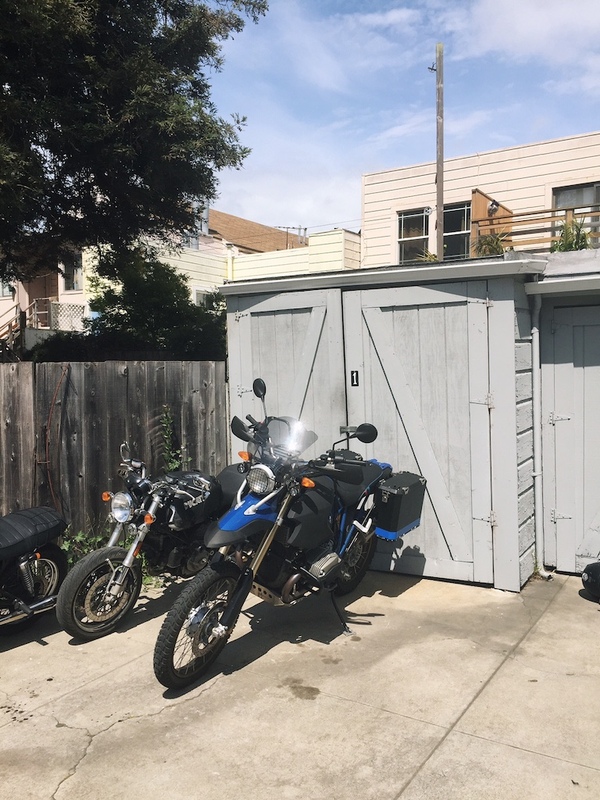 I was staying for the night at my buddy Josh's place, throughly entertaining his kids with my bike, and he told me about how he used to ride when he lived in San Francisco. "What did you ride?" I asked, naturally. "Oh man, it was something special. A BMW HP2"
No, I had to have the HP2E. I lurked the HP2 threads, read all the reports. 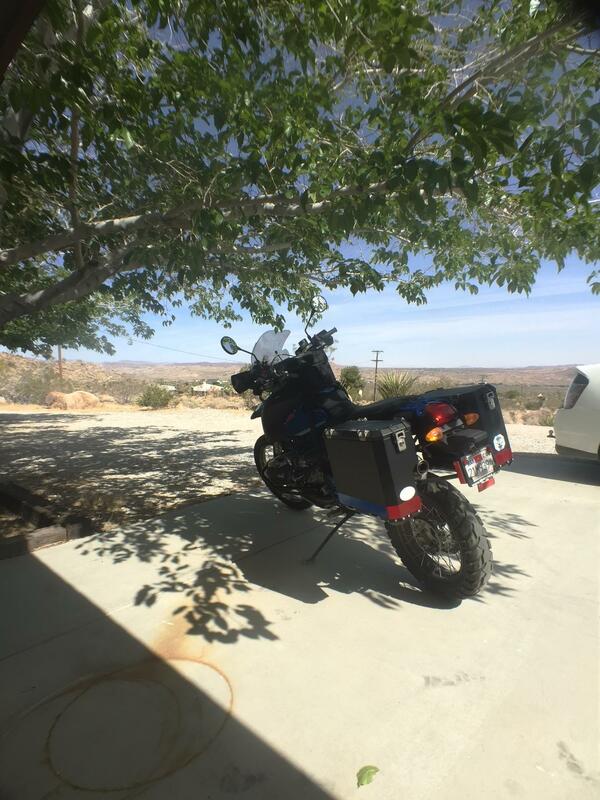 I posted a bit, and one day got a message from an inmate jt1966 who had one for sale in Joshua Tree, WITH all the upgrades I wanted to do: panniers, pannier rack, extra lights, HPN tank, passenger pegs, upgraded seat... it even had heated grips. 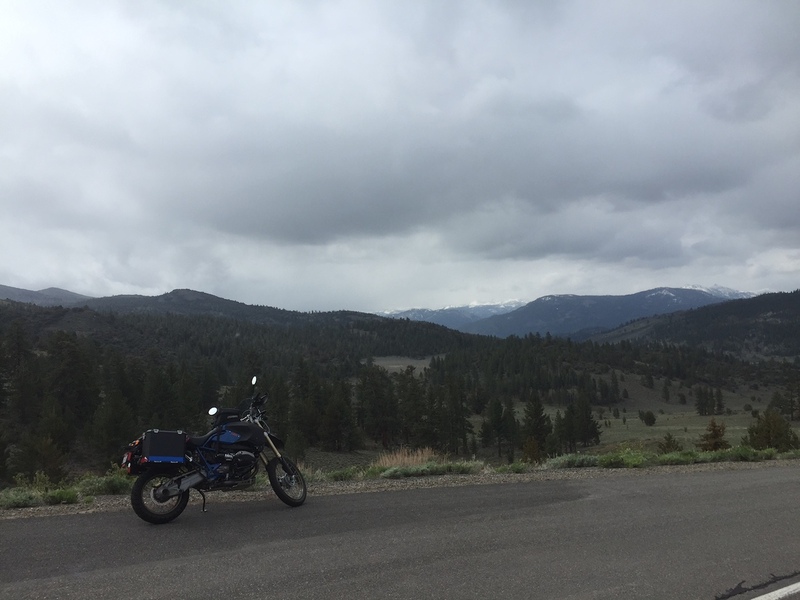 I could just go get it, and then ride it back the long way over 375, by Mammoth Lakes, over Tioga or Sonora Pass... yes, this sounded excellent. 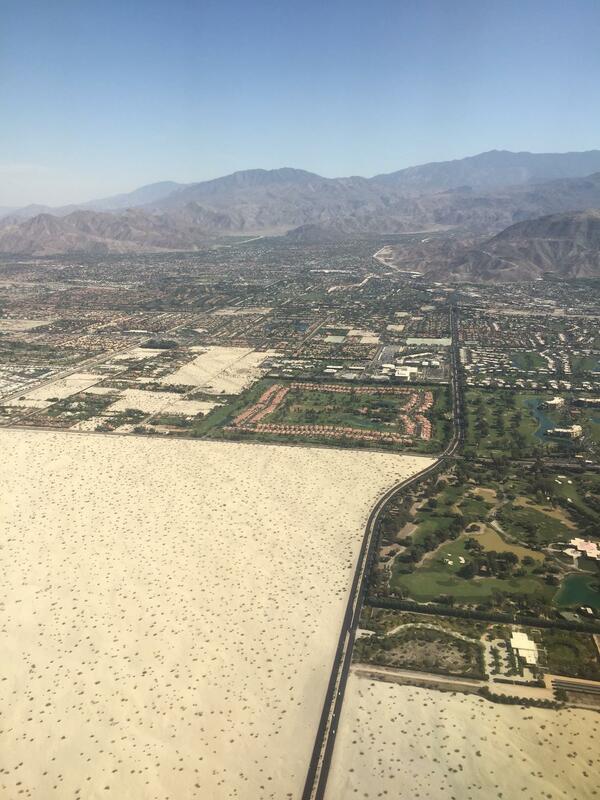 So, some messages, a short period of deliberation and a one-way Alaska air ticket later, I was on a plane from San Francisco to Palm Springs. jt1966 was on the same plane (ha!) and he'd give me a ride to where he lived. 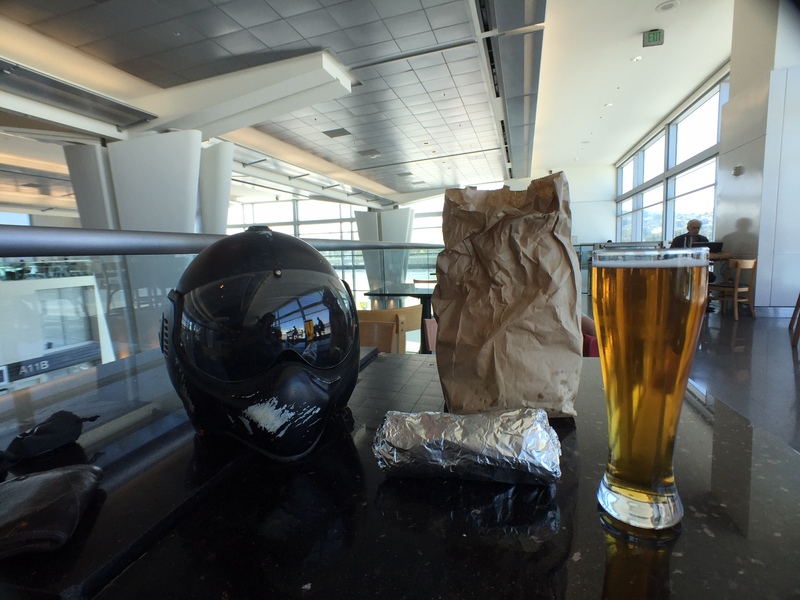 And yes, I brought a good SF Mission burrito to the airport. What? Don't judge. And what a place he lived in! 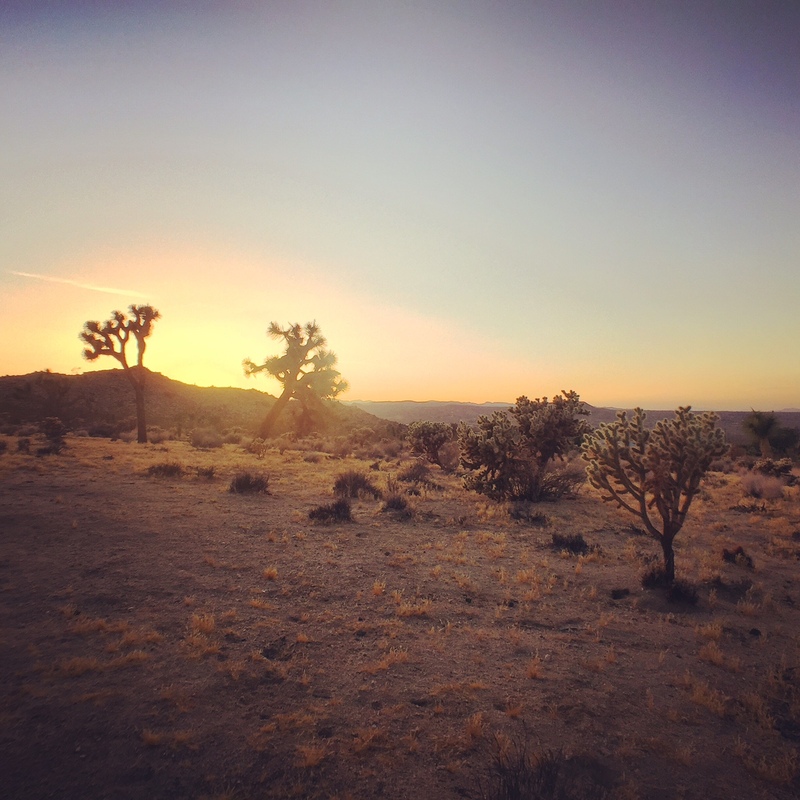 Joshua Tree is entirely new to me and it's gorgeous. I love deserts. We were just too late to make it to the bank (it had closed 7 - SEVEN! - minutes prior to us arriving at its doors, and the lights were already off) so I was graciously offered a bed for the night. 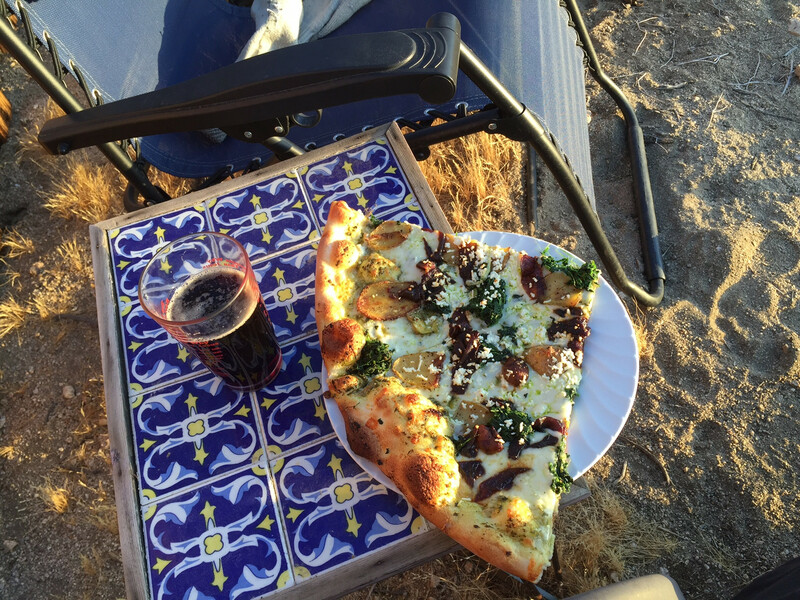 We got a tasty pizza for dinner and I chatted the night away with JT and his cool wife while drinking beers and watching the sun go down. 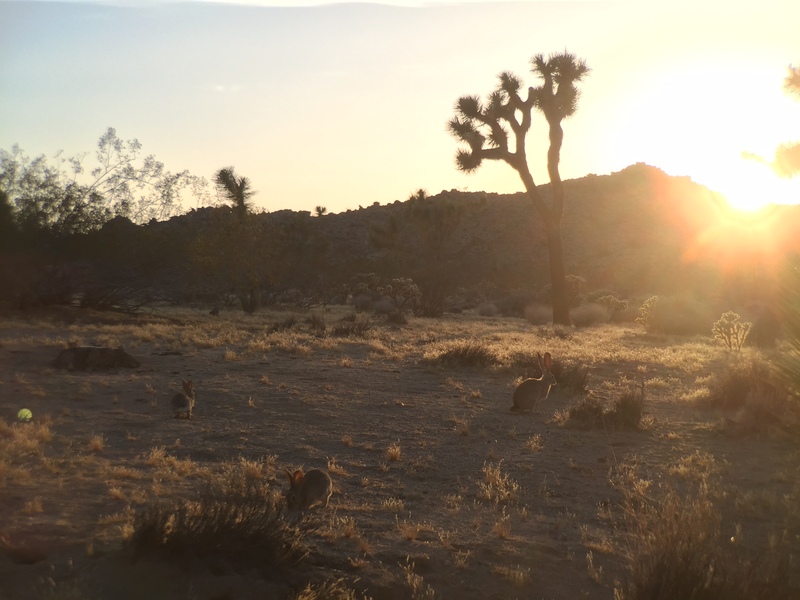 A small show was put on by the local cottontails and a jackrabbit, and some quail joined in at some point, too. 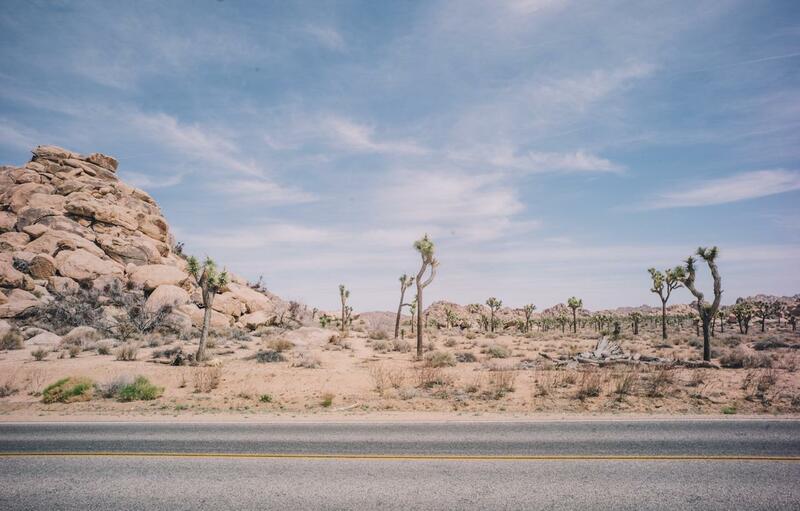 Lively place, the desert. The next morning I was up early to ogle JT's other sweet bikes (you'll see one in a bit) and of course hit the bank. The best money I have ever spent in my life was on bikes, and this was no exception. Back at JT's place I proudly loaded up the bike with all my stuff -- nice to have the panniers! 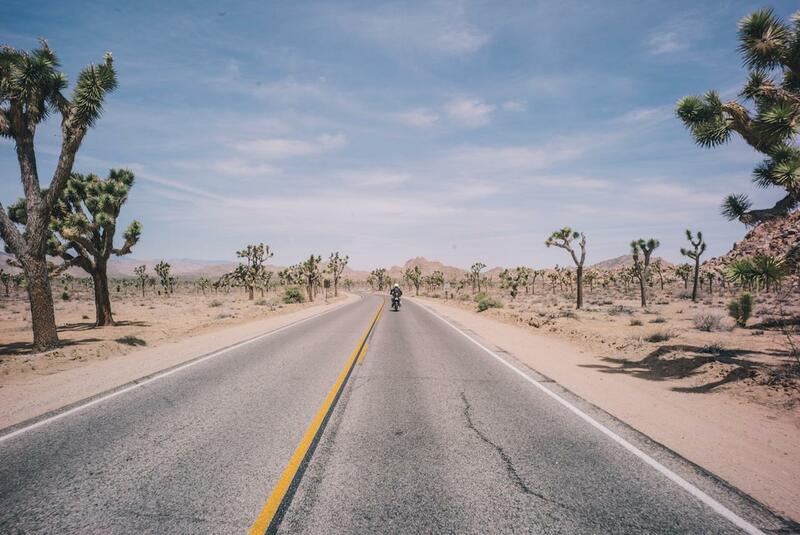 -- and he generously offered to show me a bit of Joshua Tree before I started my long route back. Uke, Mr Magoo and Rainier_runner like this. Yep, your eyes weren't deceiving you: JT has one of those ultra-rare, insane 'TerraMonster' Ducati Monster dirt-bike conversions. Insane thing, sounded great, and looked like it was awesome to ride. Into the park we went. 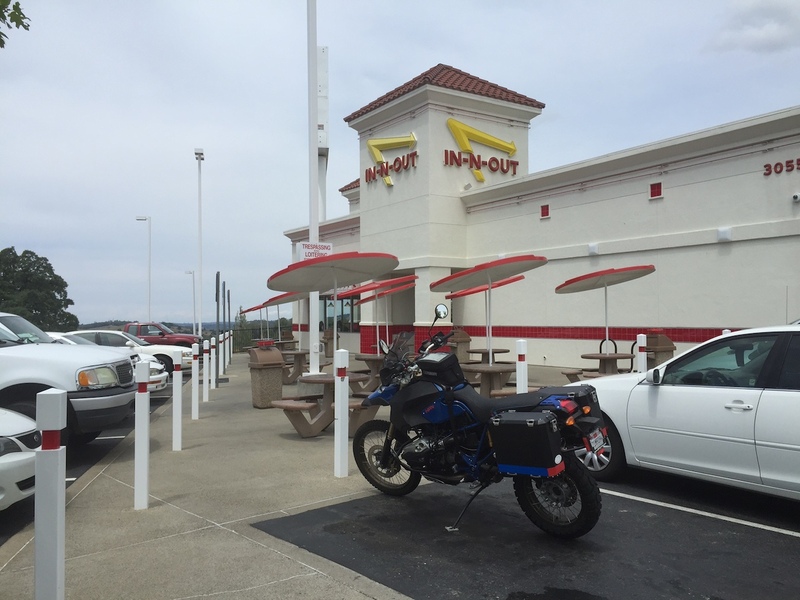 I opted to do just a short ride in, as I did have to make it back to SF in the next two days. I wish I could've spent the whole day there, it was gorgeous. 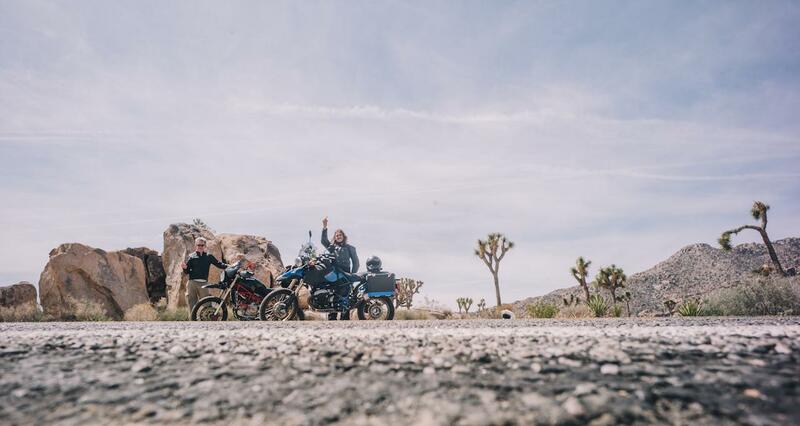 We stopped well into the park and took the required ADVrider salute photo together with the bikes, chatted a bit more, and said goodbye. What a solid dude. Always welcome in SF, JT! I tailed him for a bit in the desert taking photos. After that, it was up, out, and away. I was in all-black and feeling the heat, but the HP2 was fast enough on the highway (85 in third, anyone?) that I had no issue with heat. 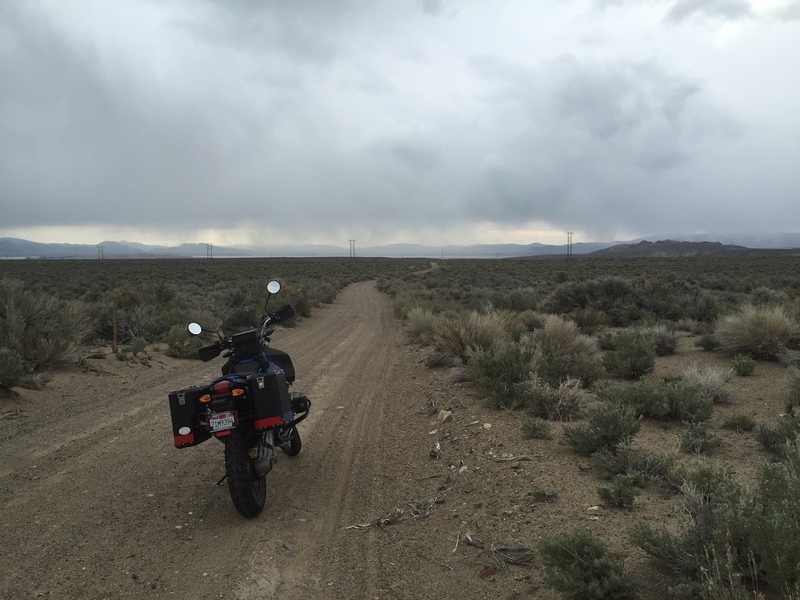 I did turn off a few times to do some easy portions of dirt roads just for the hell of it. 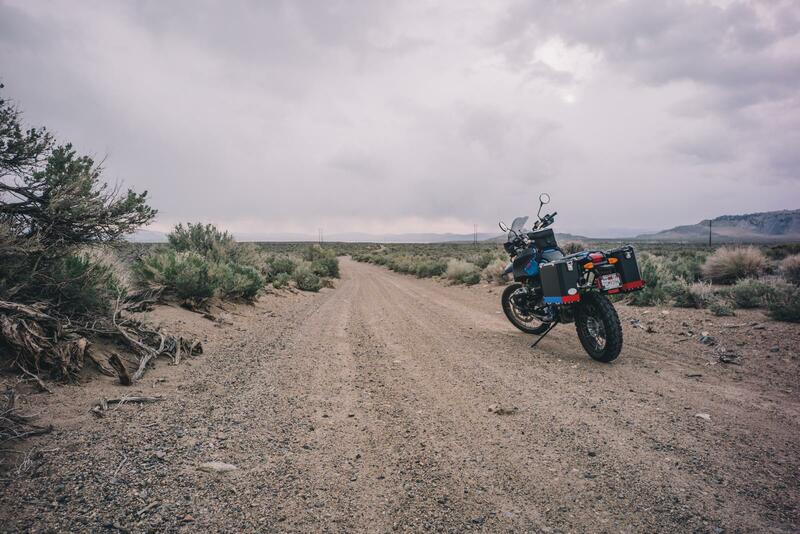 When you ride this bike past any kind of dirt road, it tends to veer in that direction automatically. It just begs to go there, and have fun in the rocks, dirt and sand. Not doing so would make it depressed and sad. 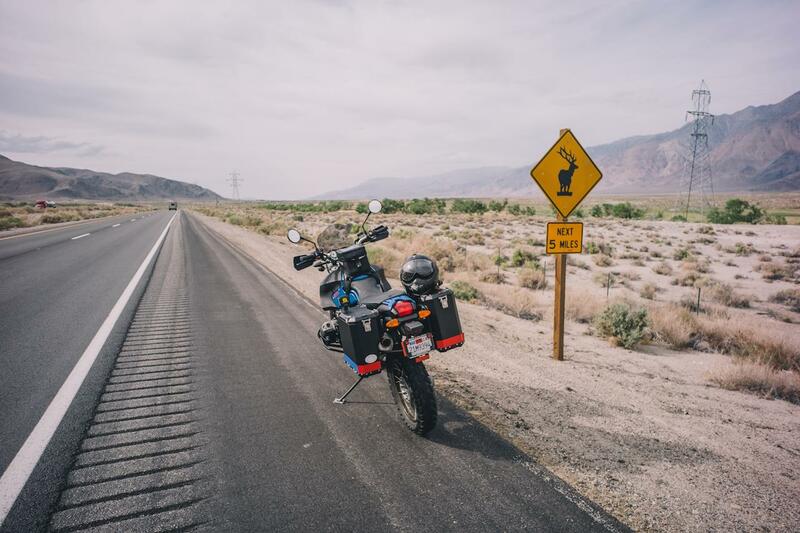 It was a great ride towards Barstow to take the turnoff to 375 -- I was behind a Delorean the whole time, which was insanely cool and kind of surreal in the arid desert. There's some serious wind-tunnels between the mountains there and I had some times where the bike was leaned over quite a bit into the crosswinds. Airplanes? 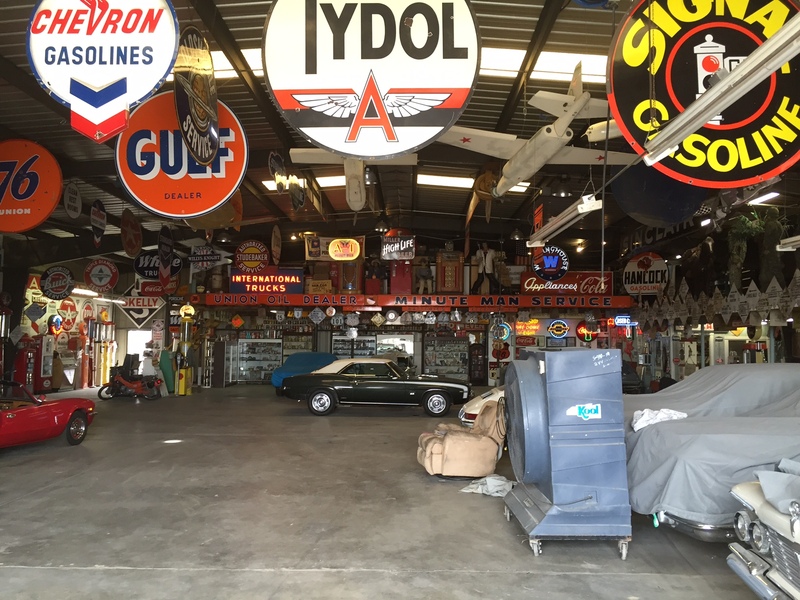 I did a double take as I turned on to 375 and promptly U-turned, crossed over the two lane road and through a big spot of gravel into a fenced and gated place where two men were working on some cars next to this beautiful sight of two planes in hangars with lots of old signs. "Heya there, how you doing?" I asked them. I talked to them a bit and said I wanted to take a few photos of the whole scene, and while they were a bit hesitant at first, they soon were infected with my enthusiasm for ALL THE COOL PLANES AND STUFF WHOA and let me take my photos. "Once you're done there come over and see what we got inside!". 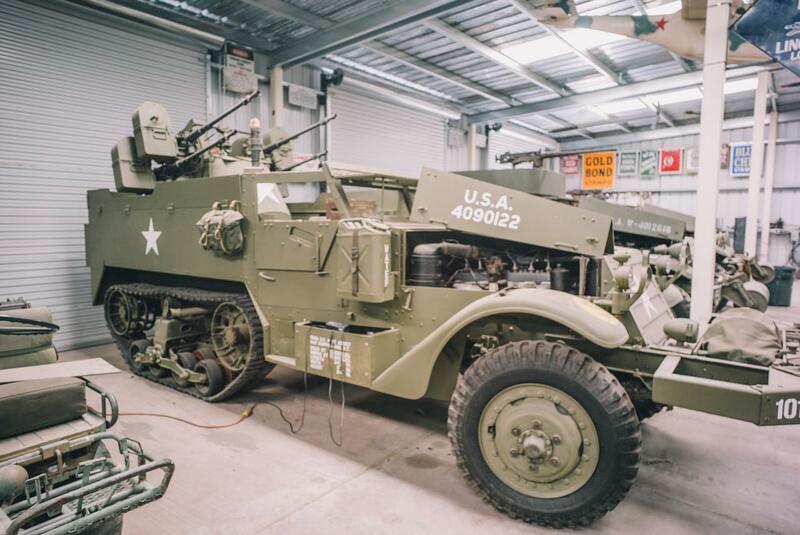 Wild promises of half track vehicles, jeeps and guns. Oh my. 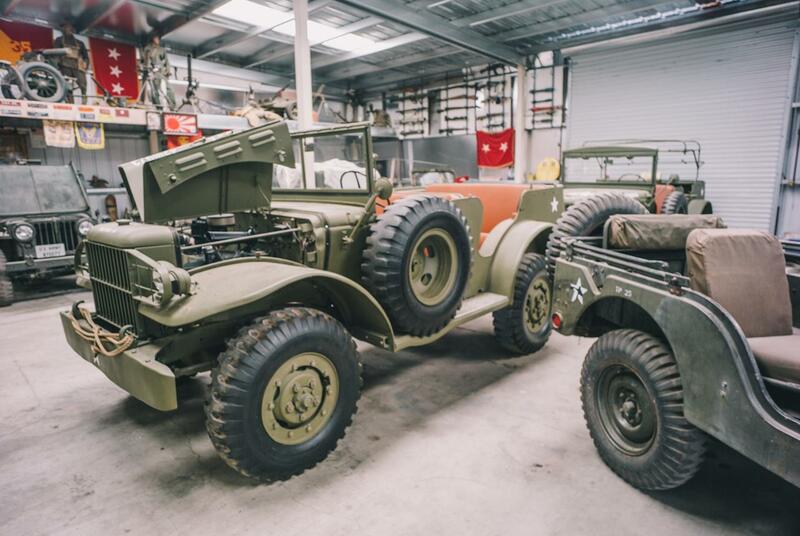 No kidding: restored jeeps from every war. A wall with vintage flags, restored old bazookas (! ), M16s, and much more. Incredible stuff. How about this half-track with a functional AA gun? 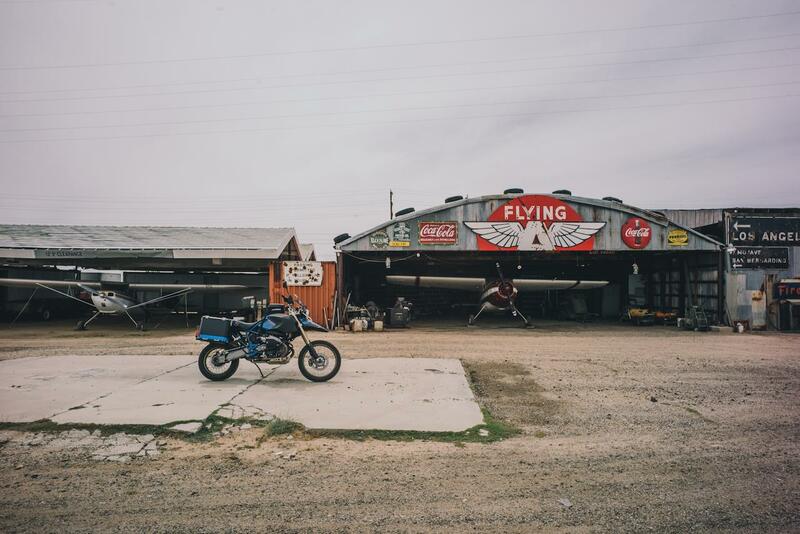 They also had an old Yamaha motorcycle and about oh, 30+ restored old gas pumps and beautiful old cars. And signs, so many signs. It was glorious, and the guys were super nice. 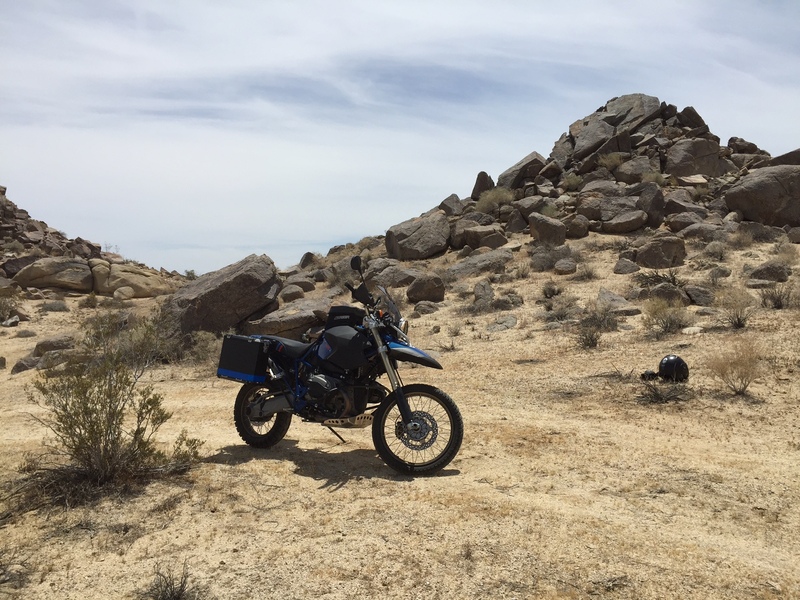 I talked a bit about the bike, and the guys loved the idea of the lightweight, stripped down and powerful high displacement dirt bike. "Crazy frame", one of them said. Yeah, I guess the frame is pretty nuts. I beeped them farewell and turned back onto 375. Sun, and rolling hills ahead of me. The rest of the ride I enjoyed the nice weather and changing scenery. 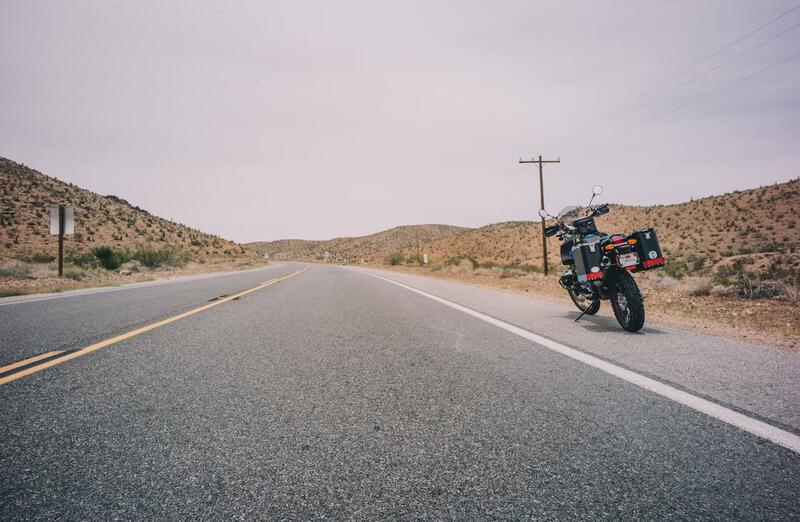 I made a gas stop in Ridgecrest, a town that gave me a bit of a weird vibe, and then pushed on. 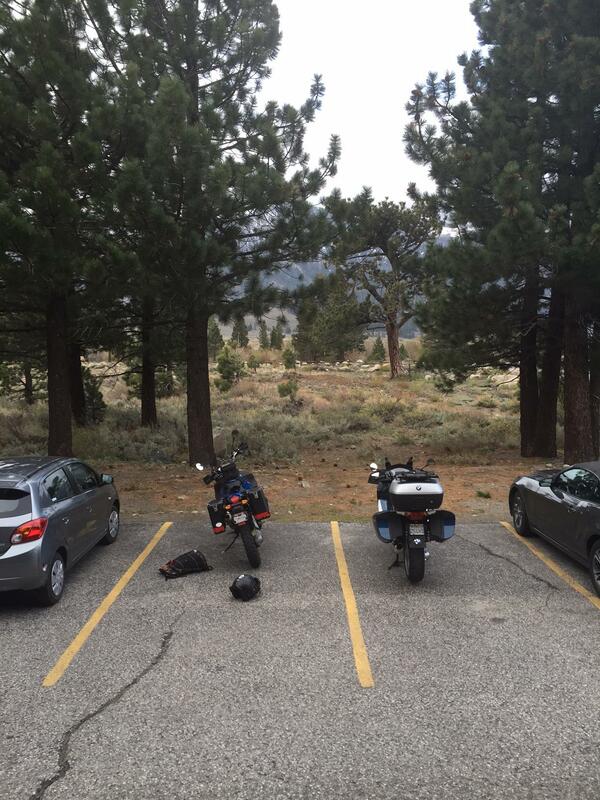 I was making pretty good time and estimated I'd get to Mammoth before dark. Sweet! 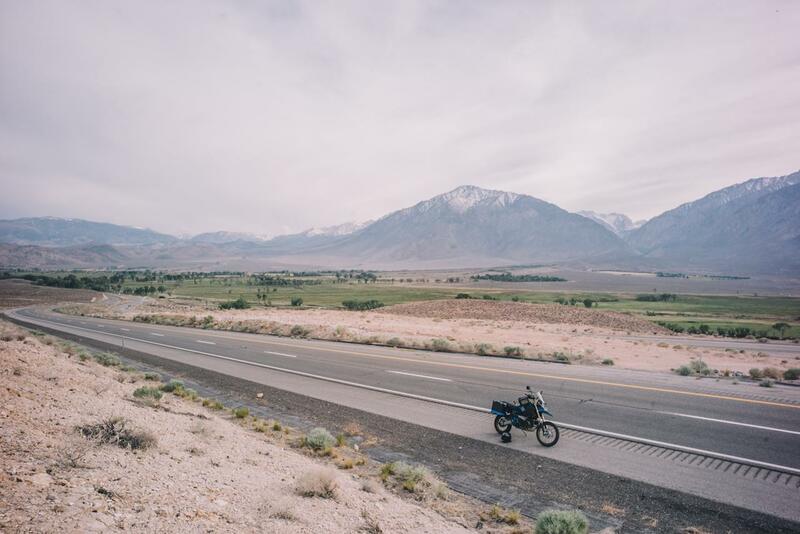 Riding 375 you realize how astonishingly empty that part of the Eastern Sierras is. You often see incredibly vast plains stretched out to infinity with only a few swatches of color in them. Almost like streaked out paint in a painting. Really pretty and makes you feel so, so small. 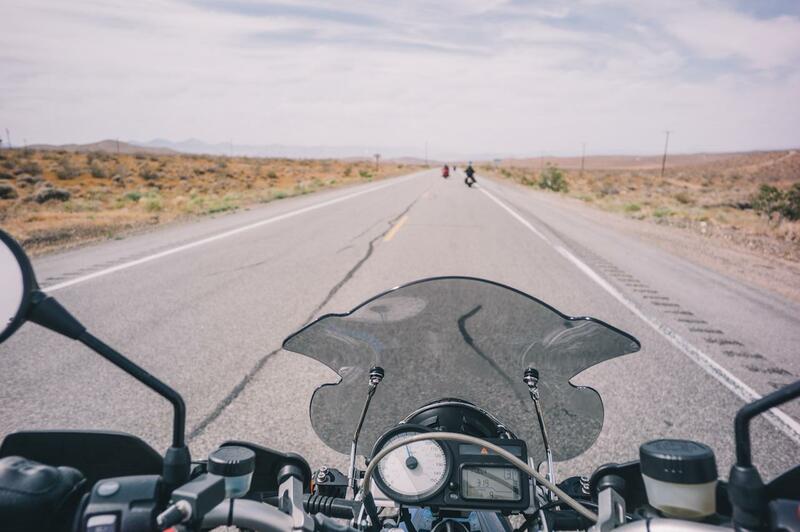 I stopped outside of Big Pine for a moment to relieve myself, eat some leftover fruit salad and ponder my next stop. 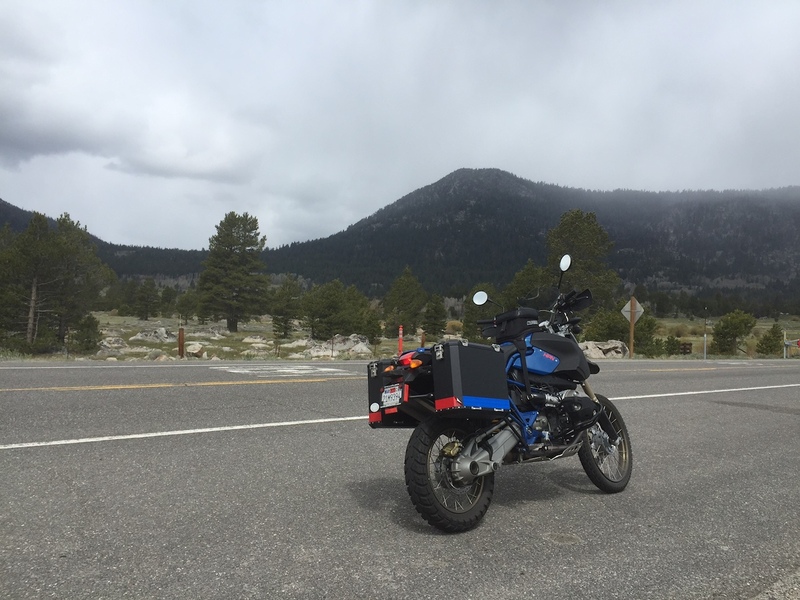 I had gas to get to Mammoth: I thought so, at least. I took a few photos of the bike, drank some water to stay hydrated and got on again. What a blast this bike was to ride, even on the highway. It just pulls, and it feels so stable and solid. 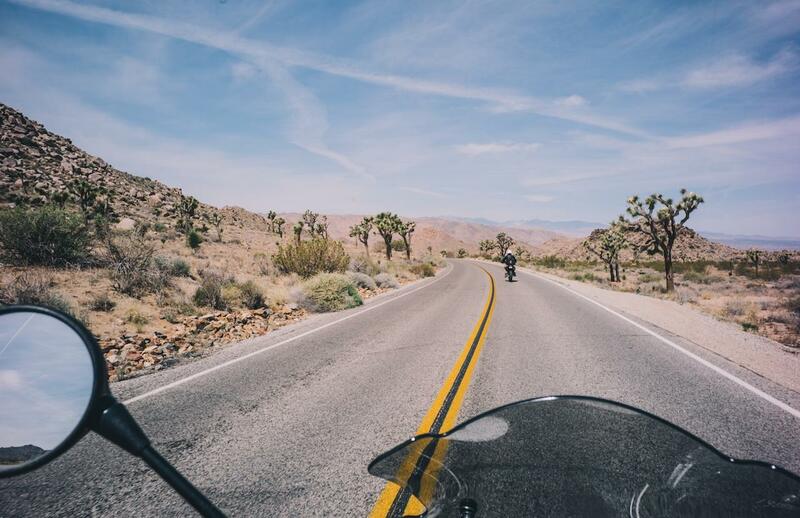 Now, for a fun and unexpected twist: I'm 10 miles outside of Bishop, CA with about 30 miles to go until Mammoth. I am stoked -- I am a bit ahead of schedule and things are looking up. Happy to be off the bike soon as it was getting real cold and I wasn't layered up for it, I pull onto a decent uphill slope when the bike suddenly loses power. I coast to the side of the road. 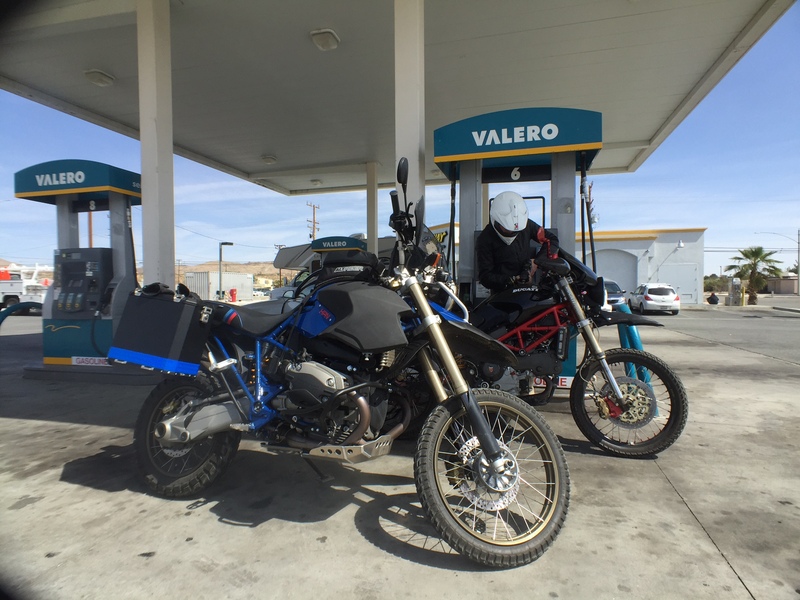 Just before, in Bishop, I rode by the gas station and just then my low fuel light came on. Now, the HP2 had a pretty small gas tank out of the factory, so HPN made an aftermarket 23L gas tank. Pretty big! I talked to JT about how the fuel light would work, and he told me that he was pretty sure the 'low fuel' light meant I had a few gallons left at the very least. Seems like our theory was a bit wrong: the 'low fuel' warning said 0 miles left, and sure enough, I had zero miles left. I called AAA, who were kind enough to inform me that the closest facility was far away, so it'd take a few hours for someone to come out to me. It was getting cold, and I wasn't happy. Crud. A pickup truck turned off the road and two guys with friendly, ah, local accents asked me what was up. What was that bike, they asked, and doesn't it have a reserve? Hm, well, you're not going anywhere anyway, we'll get you some gas, sure! With extremely grateful bowing and gesturing I saw them drive off and I waited a short 10 minutes until they came back with two gallons or so in a jerrycan. They helped me pump it into the bike, gave me some fist-bumps ("I ride myself man"), refused to take my money and warned me about all the cops around here. Thanks guys! I will pay it forward! I passed them a bit later, eager to get to Mammoth. 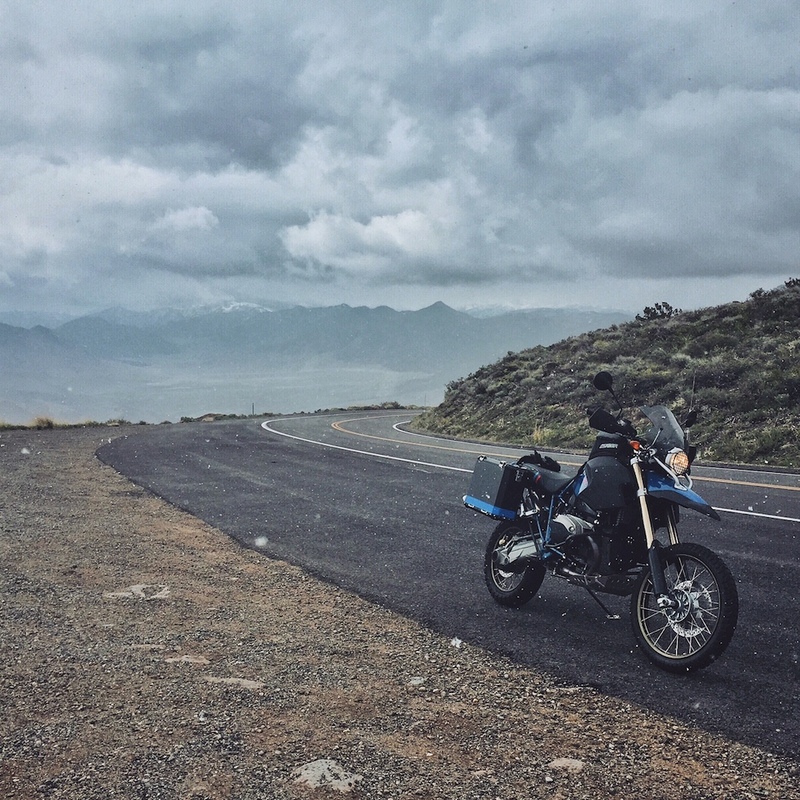 By now, I could see the predicted snowfall in the Sierras, and the cold, cold wind was blowing over the mountains and right into my face. It was getting real cold. I pulled into Mammoth, got some gas, found some food and beer and opened a nice note my girlfriend had stashed away in my bag. What a winner, that one. Uke and Rainier_runner like this. Great report Cali, love the pics from the old airport. Had mine out yesterday. Had to make a 250 mile roundtripper for blue cheese for my salad. Got my sumo wheels on, they provide you with a whole different bike. I think you're right! I mis-remembered. 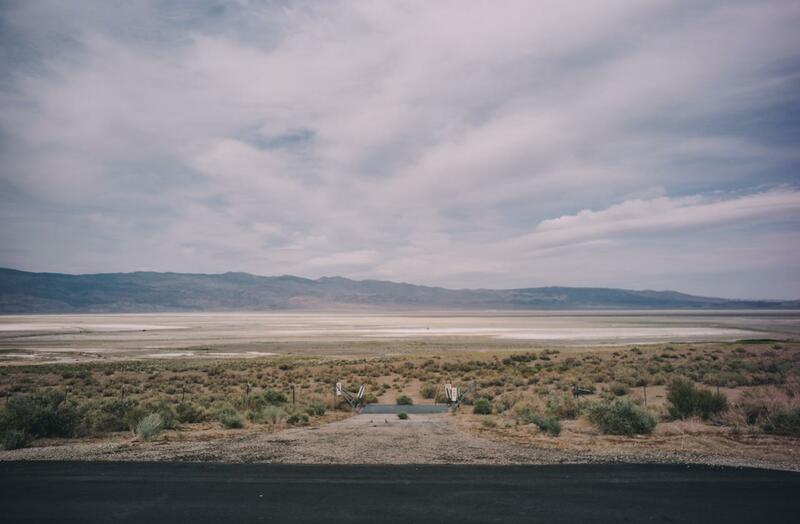 I know those places pretty well -- used to work at the big radio dishes you might have spotted just south of Bishop, along the 395. Looks like you met some of the wonderful locals in that part of the world. 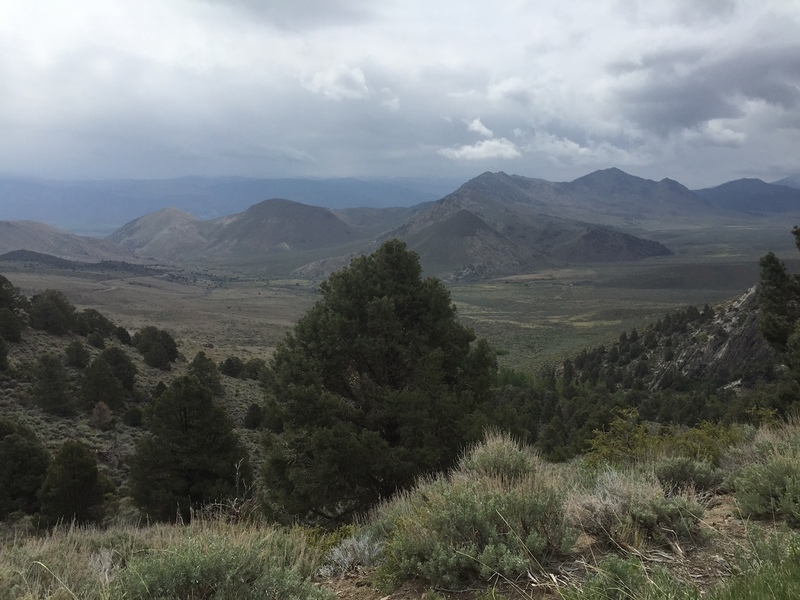 If you find yourself there again, check out the Ancient Bristlecone Forest. Fantastic. Sorry for the late update, folks! 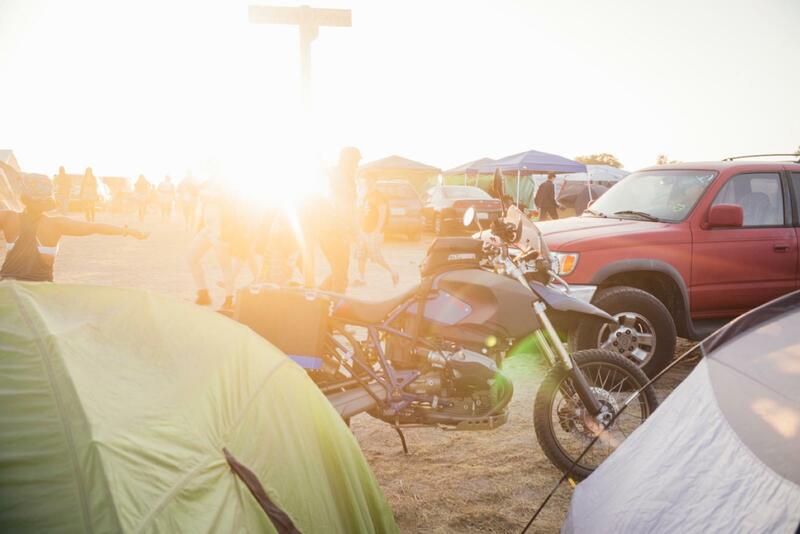 I rode the bike and my gal to Lightning in a Bottle, a big music (and often substance) fueled extravaganza in the California desert! Fun times were had. So, where was I? It was a crisp morning and the light was in the air. No direct sunlight, mind you -- Mammoth Lakes is huddled in between the mountains, so when my alarm sounded around some ungodly hour close to 5 in the morning it was a pleasant tint of blue-grey outside, with not a single sign of life. But, also not a single sign of rain or snow. And that made me very excited. 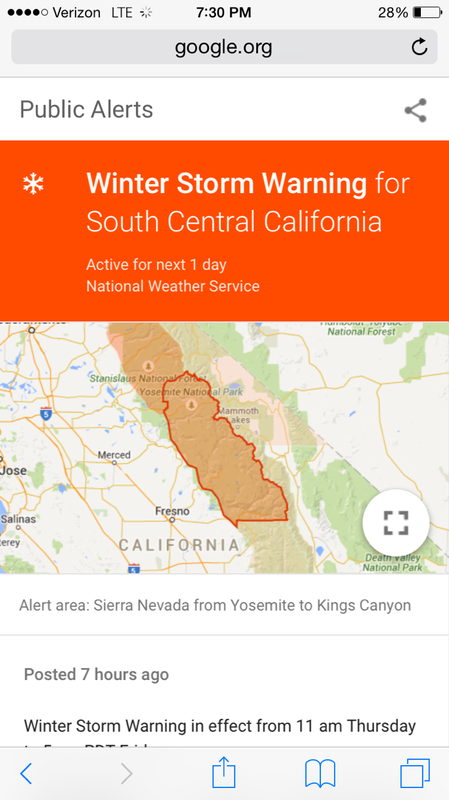 I checked the conditions again on my phone -- same weather warning as before -- and grabbed all my things, popped in my contacts and started loading up my bike. Good jesus it was ungodly cold out. I hadn't packed my weatherproof gloves because I... well, I misplaced one of them, so I had my warm weather gloves on. I ran back into the hotel to put on all my clothes (t-shirt, shirt, and sweater all over one another) and zipped in my jacket liner. I ate an apple and filled up my canteen. On we go. 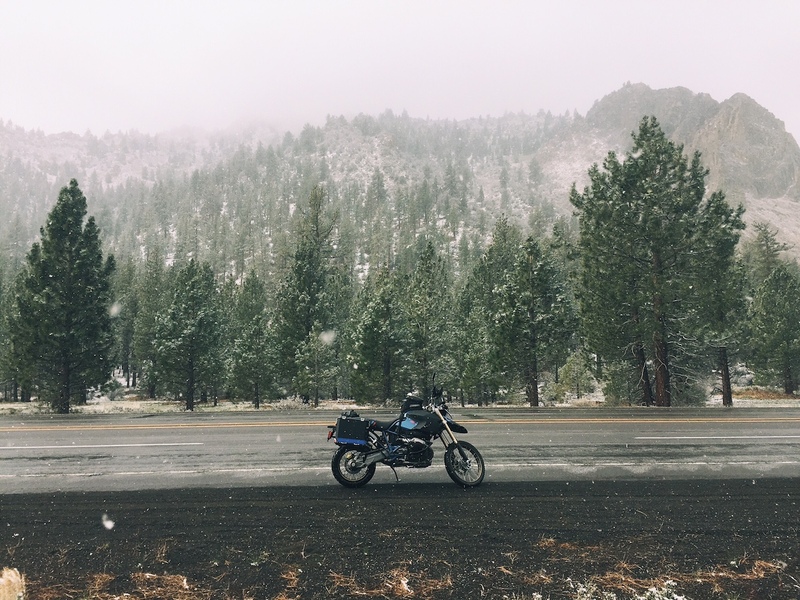 The road was a bit slippery and the bike didn't much enjoy starting in the cold but I was soon rolling out of Mammoth Lakes, freezing my balls off within 15 minutes of being on the highway. the label they applied to the sign said 'CLOSED'. In the distance I could see the mountaintops disappearing in a white haze that normally would be dark blue in a rainstorm. It was snowing, and not just a little. I pulled into the empty gas station parking lot, and talked to the attendants who mentioned it was already in the inches. The passes would all close. 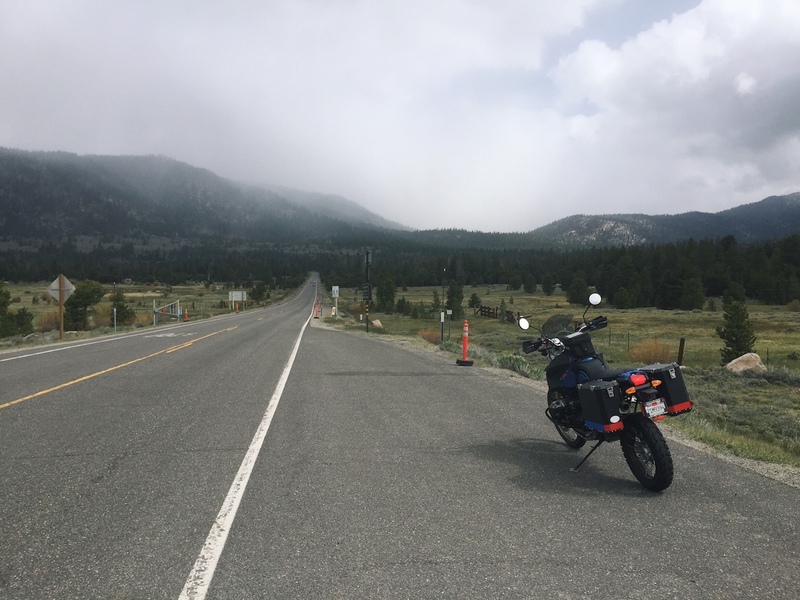 Well, I needed to make my way across the Sierras one way or another, and I wasn't going to go back to Mammoth to wait it out for a day (good thing, I found later -- it would take three days for the Tioga Pass to reopen). 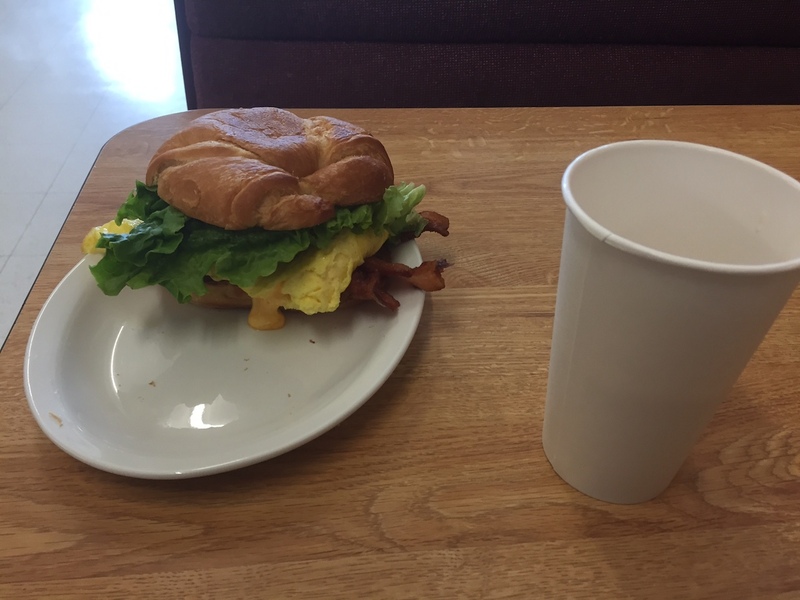 I grabbed a somewhat depressing breakfast sandwich and scarfed it down along with some coffee and rode off after talking with an Italian couple that was looking at my bike outside, wondering what brand 'HPN' was. Ha. I just decided to make time for Sonora Pass, hoping it would be open but I knew in the back of my mind that it was rather unlikely. Before that, though, I hit snow. At first the snow was pretty easy to deal with, but it soon got hard to see ahead of me and my visor was completely snowed in. It got rather chilly -- I had wisely not packed much in the way of cold weather gear, though I did fortunately have rain gear -- and I was making it up a pass towards Sonora Pass when I felt the tires slide rather freely in the turns. I wiped my helmet shield off a bit and saw the sleet and snow on the road. 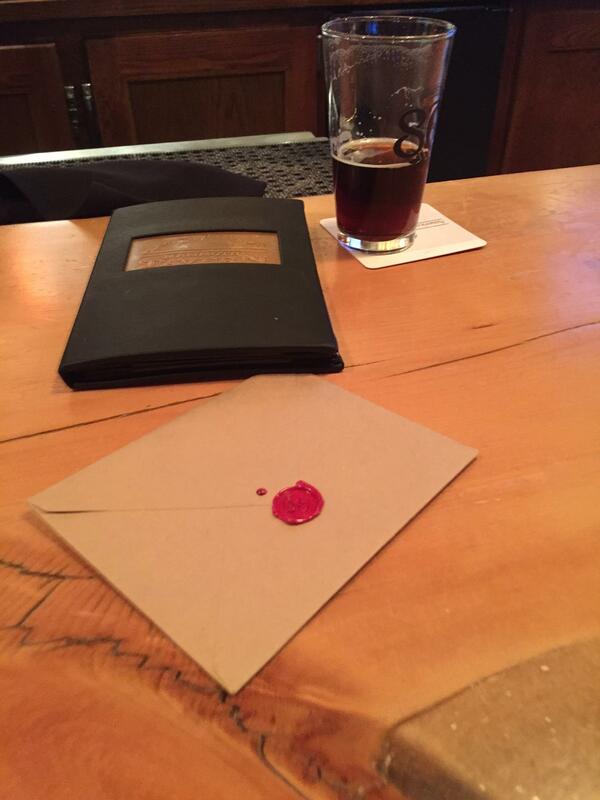 Yup, pretty slick. 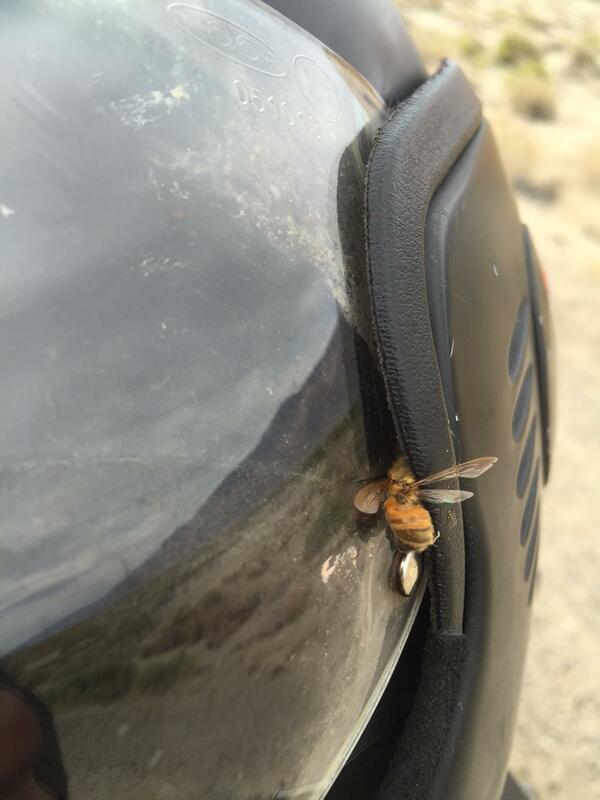 I stopped and took a photo and to clean off the helmet a bit, debating whether or not I should push on. I wasn't in any mood to go back so I pushed on. 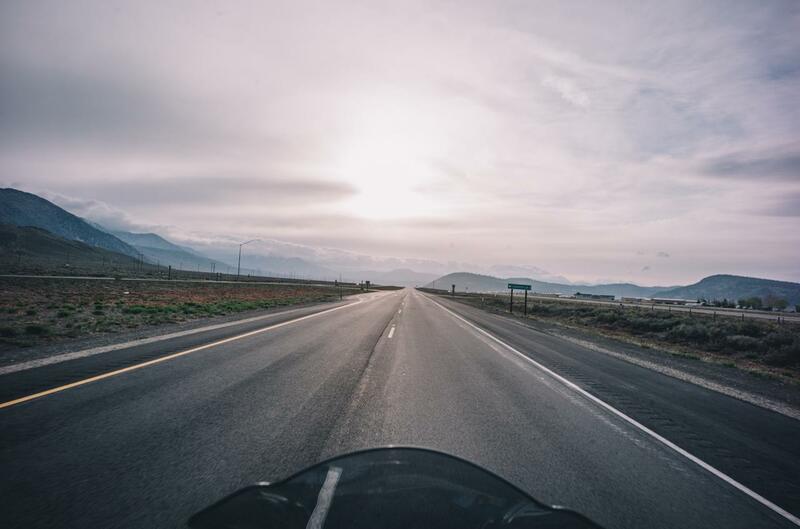 It was cold, rather wet, but the heated grips on the bike on the highest setting and continuous wiping of my shield, combined with judicious steady throttle and smooth turning made for an OK ride on the slick, slick roads, which were getting ever less populated by cars. At some point, the only people I saw left were CalTrans cars. I rolled up to Sonora Pass, saw a road crew and they informed me this pass, too, had closed. 10 inches of snowfall so far and I wasn't going through there any time soon. I wasn't lounging around this time; I decided to just make a run for Monitor Pass, my last pass before having to loop all the way around and take the I-80 by Tahoe... if that was open, at least. I made it to Sonora Pass and by some bewildered gatekeepers, on to the beautifully curvy, guard-rail free road to the summit. It was glorious: not a single vehicle anywhere nearby, even with my few stops for photos. The pass had a few nice views, which were mostly obstructed by the snowy haze covering all the Sierras, and plenty of thick snowfall near the top. It got a bit icy at the top, even! Once through the highest part, it was a relaxed ride downhill for a bit where the weather cleared up nicely. It got wet first, and then soon it was sunny as I rode into Markleeville. 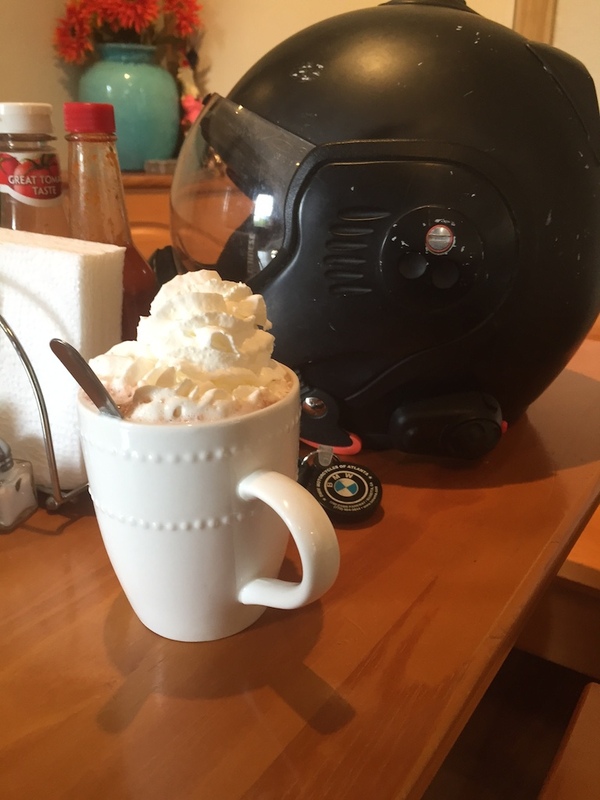 I treated myself to a nice hot cocoa at the café. Nice folks there! The rest of the ride was much easier! 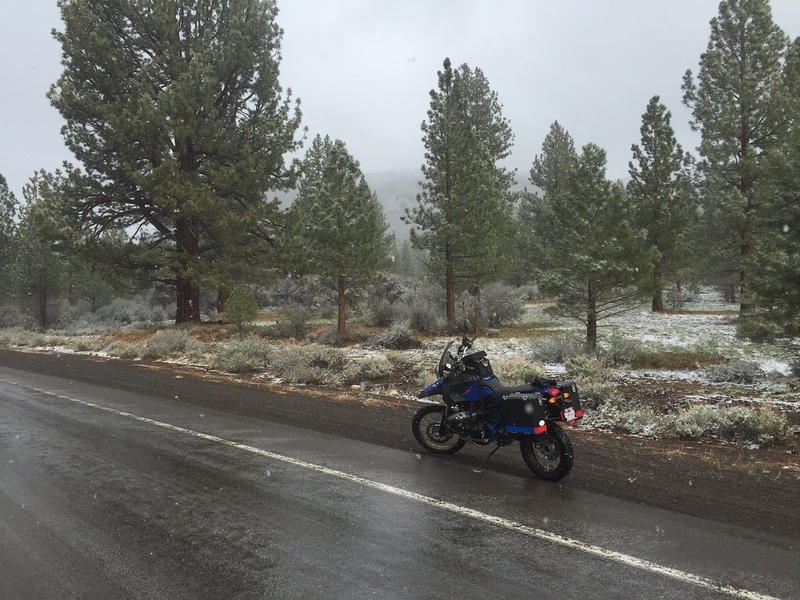 It was chilly but mostly snow-free on my ride to Alpine Village, where I cut over to the Route 50. 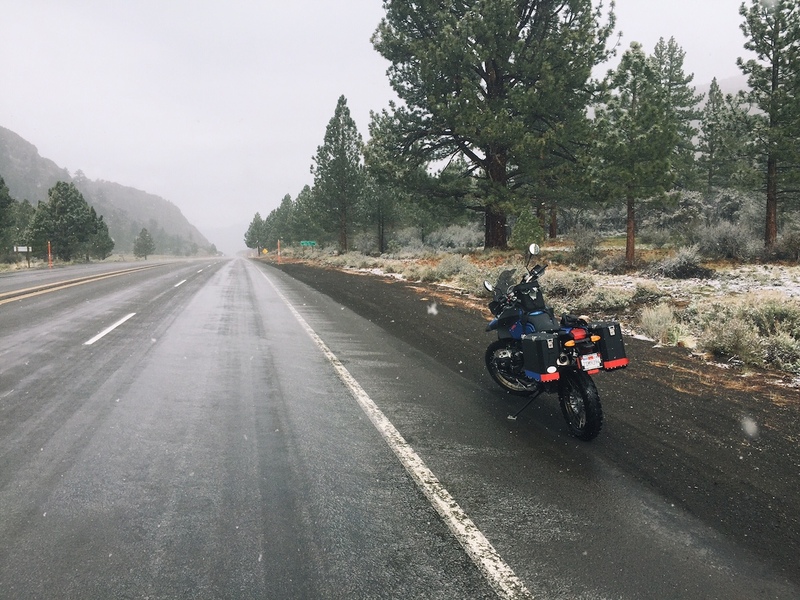 I stopped a bit for gas in Strawberry, where I had a nice talk with the shopkeep and saw some snow arriving again outside, so fearful of worse conditions I rode the nice gentle curves grinning all the way to Placerville. I had done it! I beat the Sierra winter storm. I treated myself to --- what else here in California? 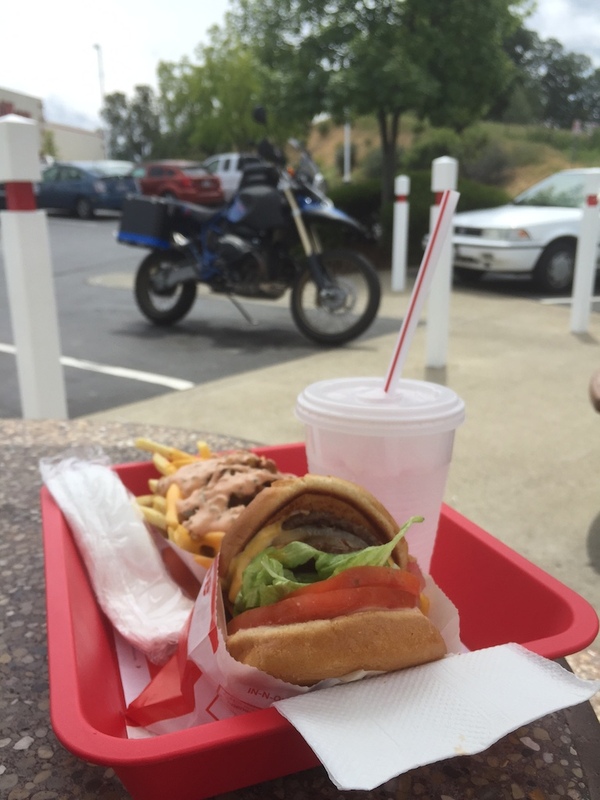 --- In N Out burger, and rode the freeway back to SF. A last glam-shot on the bridge. Now, to get out and have some adventures on this beautiful thing! And man, this thing makes my GT1000 look so tiny! Thanks for reading! Check out my Ducati GT1000 Prudhoe Bay RR that is in progress! RedDogAlberta, Uke, The Toecutter and 1 other person like this. Interesting RR. Nice looking bike. I love to have a HP2 so badly. My dream-bike now!!!! 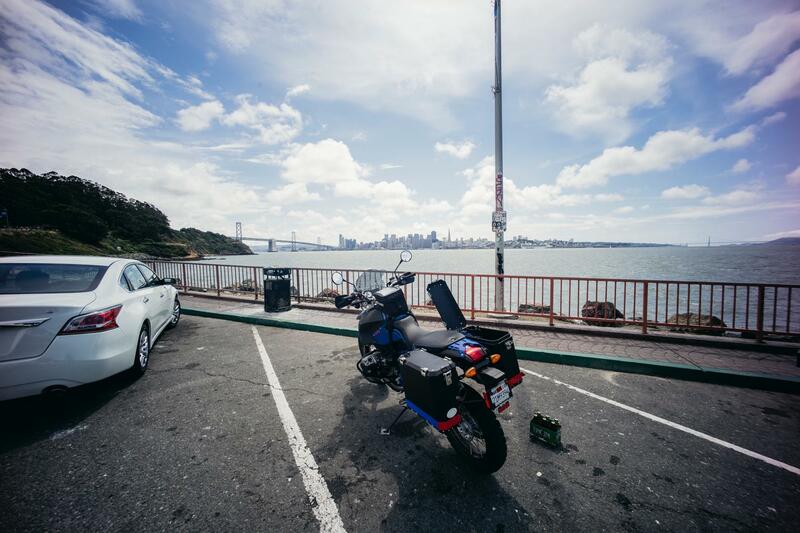 Cool ride report... and for some reason I'm hungry and crave a beer??? 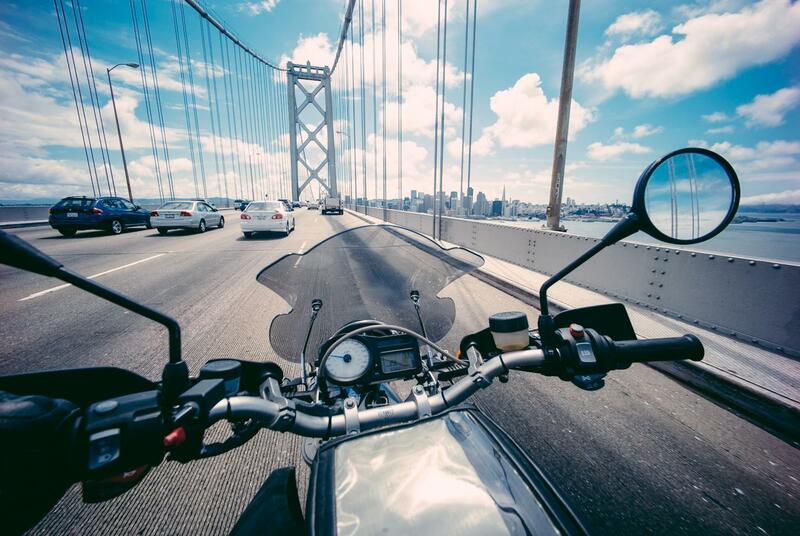 Excellent Buy N Ride report! I found it through your rideearth website which I am now anxiously waiting for your south america journey to begin! Good report, glad someone checked it recently, I missed it in May. 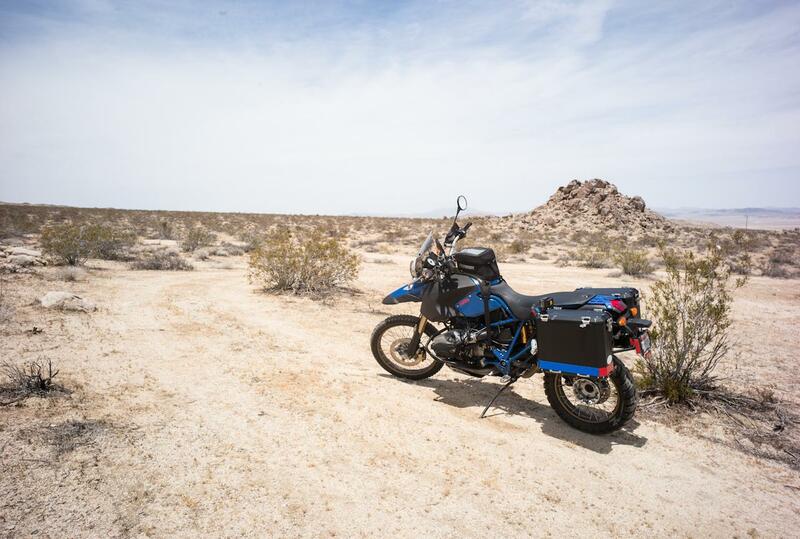 I ride the baby BMW X Challenge, and it also veers off to every dirt road. I heard there was one entered in the Baja 1000 a few years back. I guy on a Honda was doing a 100 mph on the beach, when something blew by him, in a blur. It was the HP, doing about 240 km, that's like 145 mph. Hope you are still likin' your beast. belated congratulation on the hp2 and a nice RR. best looking bmw in my book. rode mine last saturday after 6 months.....i knew have it in the garage.